WARNING: This is a tech-heavy, geeky post tying a lot of training concepts together. h/t to Henry David Thoreau for the title. I read the quote yesterday, stuck in a tube hurtling at 400mph through the atmosphere over the upper midwest, reading “The Omnivore’s Dilemma” by Michael Pollan. It’s a very interesting book that deserves a write up in another post. Grab a copy now. A couple of posts ago I had mentioned that I had run across a tool that had me reevaluate my training, specifically when I need to peak and when I need to begin my taper. I’m pretty certain that this “discovery” helped me in my very successful 60K last weekend. The tool? 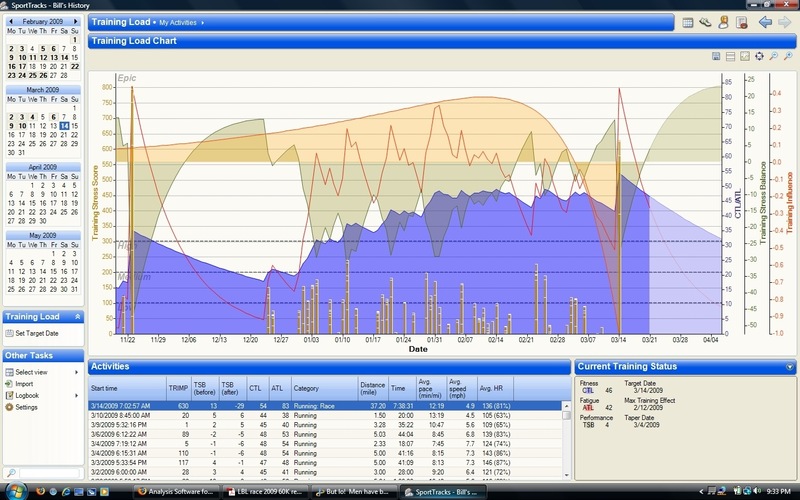 It’s a plugin called "Training Load”, used in the excellent free software called SportTracks. 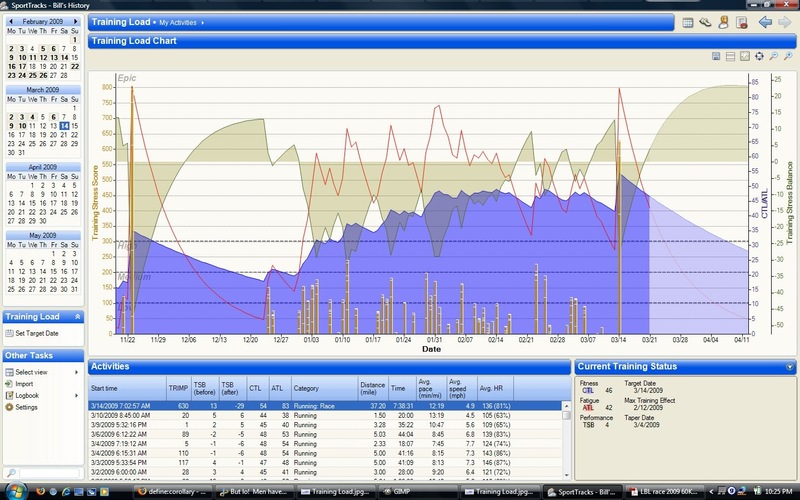 SportTracks is everything that Garmin Training Center and Suunto’s Training Manager should strive to be. And having used both extensively, Suunto’s Training Manager beats GTC hands-down. But neither can match SportTracks. What’s so magical about the Training Load plugin? It calculates the accumulated load of training (hence the name), which can then be used to determine your fitness, your fatigue and your form. The higher your form, the more ready you are for a particular race. I’ll touch more on that later. 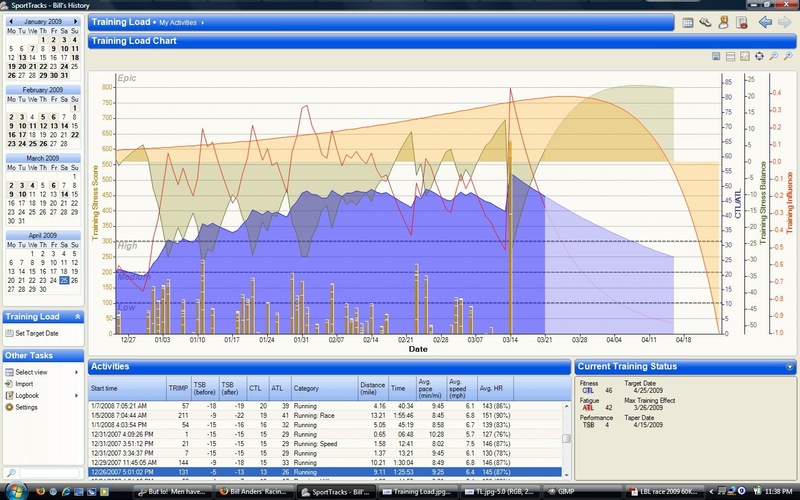 For those of you who’ve looked at other tools such as Training Peak’s WKO+, this appears to be fairly similar. I have not used WKO+, mainly because I don’t need the added expense since I don’t have a power meter on my bike. So I’ll stick to the free SportTracks for now. But even after I buy a power meter in the (hopefully not too distant) future, I may stick with SportTracks, since Training Load will use the data from the power meter as well. I’ll throw out the disclaimer now – I am by no stretch of the imagination an expert in all of the concepts I’m about to describe. I’ve done a lot of reading on each, but I recognize the fact that there’s still a lot of discussion on how to derive and what these numbers mean. Even the “experts” admit that these charts and their interpretation is something of a “black art”. Much like my chosen field of meteorology, you can have four people look at the chart and get six different opinions. Lots of data on the left and bottom, but those aren’t important right now. Besides, if you can’t figure out a calendar, you’ll never figure out this software. If this describes you, click here and read about your other exploits. We’re mainly interested in the graphical part of the program, because a picture is truly worth a thousand words. The x-axis is calendar dates, starting at about 19 November 2008 and ending about 6 April 2009. This scale works well since it is bookended by two significant races – my current marathon PR run during the Flying Monkey Marathon on 25 November and my latest race, the LBL 60K Trail Run on 14 March. The total training load of each day’s run is indicated on the y-axis by the gold vertical bar. The more significant the load, the taller the bar. Compare the marathon and 60K events to the daily runs. The training load is calculated by the amount of time spent in each training zone and each training zone is given a weighted value so that one minute in Zone 5 is given more weight than one minute spent in the lower zones. NOTE: I’m not giving specific values here because it differs for each person. I’m still trying to figure mine out, so the numbers that you see in the graphic will not compare to another person at all. The proof is in the pudding on race day. Each day’s training load is calculated and a cumulative training load (CTL) is calculated. That’s the blue area of the chart. CTL is also known as “fitness”. As you can see, I’ve gradually improved my fitness from the end of December until now, which shows the results of my training program. All things being equal, it’s pretty easy to see that my fitness was significantly better leading up to my 60K than I was for the Monkey Marathon. That backs up my tests, which have proven that I’m in better shape now than I was just five months ago. Starting at the Monkey Marathon, my fatigue was through the roof, then dropped off rapidly as I took my year-end break from running. Fatigue is also known as Acute Training Load (ATL) and is signified by the solid red line. On the y-axis, higher numbers are more fatigue and lower numbers are less. Pretty simple, eh? Starting with my training in late December, you can see where my cumulative fatigue started increasing, but would drop every few weeks as I took my recovery weeks. A couple of the more significant dips were from having to take a complete break from training due to illness or overreaching. As you know, success in endurance sports is all about fatigue management. The corollary of fatigue is form, shown as either “performance” or Training Stress Balance (TSB). That’s the gray area of the chart. As fatigue increases, form decreases. As fatigue decreases, form increases. After the Monkey Marathon, my form was in the tank, meaning that I likely wouldn’t have been able to race again in the weeks following with any degree of success. It wasn’t until 5 December, when the TSB value equaled zero, that I could be considered fully recovered from the race. After that date, as I continued to rest, my form improved. But since I wasn’t running, my fitness (blue area) was decreasing. And that’s always the dilemma of racing like we do, trading fitness for form. One interesting thing to note is that as form improves, recovery time decreases significantly. Compare the time it took my form to return to zero after the Monkey Marathon to the time it took me to return to zero after the 60K (12 days vs 6 days). Once I started running again in late December, my form “suffered” as started my training in earnest. As my fatigue increased, my form decreased. But, most importantly, my fitness slowly started to increase. At this point, looking at the chart above confirms a lot of what you can feel in your bones, specifically the fatigue. It’s often hard to feel your fitness improving when you’re smoking yourself week after week. But taking a look at the fitness (blue shaded area) of the chart can give you that boost that you need, especially when you feel like you can’t do any more. For example, my heaviest week as far as cumulative fatigue was at the end of January. You can see that my fatigue (red line) spiked and my form (gray shaded area) hit the floor. That week I hit 44 miles of running, including a 10-mile tempo and 15-mile long run, as well as a couple of shorter interval sessions. While the mileage wasn’t as high as later weeks, the intensity was there. And since the higher HR zones have a heavier weighting, there was more of an impact on my fatigue and form than at any other time. By comparison, the week of 9 February I ran 60 miles for the week, but at a much lower overall intensity, so I was actually (gradually) recovering during that higher volume week. Phew!!!! That’s a lot, isn’t it? I started using the Training Load plugin in late January, soon after it was released. It was a huge step in visualizing the ebb and flow of training throughout the year. And thanks to a bit of creative database work, I was able to combine my workout data from my Garmin and Suunto HRMs, giving me a look at all of these parameters (CTL/ATL/TSB) since January 2007. No sense in posting the pic here, since it’s really a jumble of lines and colors, but trust me when I say it’s a treasure trove of information. Based on custom values, I can now visualize when I should be peaking for a race and when to begin a taper. These custom values are based on my ability to recover, which are different from other folks. Previously I had been using a standard three week peak, followed by a 7-10 day taper. But once I loaded this “Training Influence” curve, I realized that I would be starting my 60K fatigued. How did I know this? Simply by setting my target date to the races that I have done in the past, I looked at when I built to my peak and when I started my taper. I noticed a trend – I had peaked about a week later than I should have, which had the result of cutting short my taper. This meant that I toed the line at each of the races in a fatigued state, with my form often not up to the “0” line. Unfortunately, I discovered this tool while I was sick on 20 February. Based on the calculated curve and the data listed in the lower right corner, I needed to have scheduled my peak for 12 February. Each day after 12 February mean a decreasing positive effect on the outcome of my race in 14 March. And once I reached 4 March, no workout I did would have a positive effect on my race, so that would be the start of my taper. After this discovery, I quickly reshuffled my training schedule and backed off an epic run scheduled for 28 February. The impetus behind this was realizing that it wouldn’t have the positive effect on my race outcome as I had previously thought. That turned out to be a good move, since the cumulative effects from my flu and trying to get right back in to running hard kept me from running anything significant that weekend anyway. By 4 March, my mileage was dropping drastically. It was tough to keep the effort under control. My run frequency remained, but had to cut back the distances and intensity dramatically. In other words, a taper properly executed. The interesting thing for me was watching how each little run affected my form, evidenced by the blips in the gray shaded are as I approached race day. But as you can see, my form (gray shaded area) during my taper improved significantly, pushing into the positive category, indicating my recovery was on track. By race day, my recovery was complete and my form was as good as it could get without completely taking a month off from training. And the proof was in the pudding. So how about for planning? Thanks to a trip this week that kept my too busy to run, which actually worked out well after Saturday’s 60K, I’ve completely recovered based on the chart. I guess I could race again right now, although it would have to be a shorter distance. But that’s not my goal. The CMM is the goal. And I hope to PR again this year. So using the Training Influence curve, I see that I need to really ramp up my running this coming week, with my maximum training effect on 26 March. Luckily I have Friday off, so I can schedule a long, long run for the 27th. Then I’ll closely monitor my fatigue in the following weeks, begin my taper on 15 April and attack the course on the 25th. And we’ll see if it works out for a PR. That’s a lot, isn’t it? If you’ve made it this far, let me know. I’ll buy you a beer when we meet. There are a gazillion other links out there covering these topics. Read, read, read. Then use. But don’t become a tool of the tool. Or better yet, don’t be a tool. Holy crap that’s an awesome post! I read it around lunch, and then read it again now. VERY VERY good. I’ve been hearing a lot about TSS and associated components, and this really helped to put it together. I’m just installing the plug-in now. Given I have nearly two years of daily data in ST, I’m looking forward to seeing what it says. Thanks for the post. These tools are great learning experiments. And really, we are all an experiments of one. — now if the data could somehow be more standardized and portable? I may take a look at this software though b/c most my athletes are not going to purchase WKO+ , and this looks like it would give some good info to those who already use their Garmin’s. You said that they are talking about adding powermeter info to the software capabilities? I’ve actually got this installed but hadn’t figured it out yet. Great post. Great post. I was having a hard time figuring out what I was seeing…this is a good start. Well, how did it work out to achieve your PR? Just wondering if this was truly a good guide to performance…how about an update?? Great info, I just installed this plugin and am using your post to help me figure it out. Hope you can take even more time at some point to give us all more insight into the tool. I have both ST and WKO and I find I use ST more to track my training and fatigue. WKO is great for looking at individual workouts, peak power data, and overall TSS/IF, but ST is a much better programme to work with in general — much more user-friendly and customisable, plus the ability to track equipment, athlete info, etc. My suggestion: for people training with powermeters for cycling (for which WKO calculates TSS) or pace-GPS devices for running (for which WKO calculates rTSS), just take the figures that WKO produces and enter them into SportTracks in the notes field of the workout as TRIMP=X where X is the TSS or rTSS value. Training Load will use this value for its charts and calculations, making the graphs essentially equivalent (but way nicer!) than the same Performance Management Charts in WKO.